Through my observations, rock climbers are typically interviewed and highlighted by news sources coinciding with a specific accomplishment. Some are highlighted more than others, just as some accomplish terrific feats far more often than others. It is not uncommon that some receive accreditation above others due to their overall fame and likability within the industry. However, these talented athletes, many of which have dedicated their entire lives and futures to the sport, are virtual mysteries to the public, aside from the occasional interview or personal Instagram story. There are most likely less than 200 climbers worldwide who make their entire living off of being a climber. It’s rare, it’s an honor, and it’s a dream come true for those who accomplish this. Rarer still are professional athletes who can blossom their climbing careers while attending and graduating a university with additional credibility and success within the industry. As soon as she was knowledgeable of competitions, she decided to enter, leading her to a sit-down talk with her dad about needing to quit baseball and focus on her climbing. Aside from the support Kiersch received from her climbing family, her own family was there every step of the way. 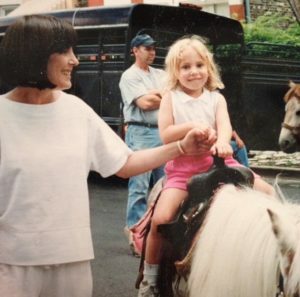 “My parents drove me across the city to climbing practice, across the country to competitions, and across the world. They have always been the biggest supporters of any endeavor I was passionate about,” Kiersch says. With a role model and parent who highly stressed education, Michaela had no hesitation when deciding to attend college after high school graduation. She also did not pick a “gimme” degree, opting instead for Bioscience in the College of Science and Health with the ultimate goal of attending graduate school to become an Occupational Therapist & possibly hand specialist. Michaela enjoys challenging herself across a variety of platforms, whether it be through the physical and mental challenge of pushing herself in her climbing or the obstacle of pursuing her education. Just as Michaela Kiersch has forever been a self-motivated, hard worker, she has also always taken note of the functionality of time management. While she believes much of the climbing community fears that “college may stunt your growth or performance,” she believes that if you remain dedicated, focused, and practice time management, you can be successful. 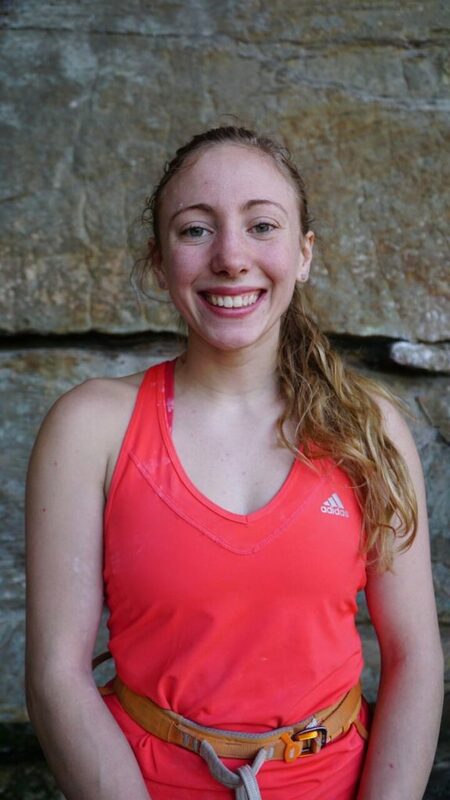 Michaela is the perfect example of someone who was able to do it all and climbed her hardest sport routes while in school. Having a set schedule allowed her to maximize her training time and commit to her workouts or trips one hundred percent because her time was valuable as well as limited. This balancing act made her more efficient in all aspects of life, translating across her schooling and climbing allowing her to be more successful in both. While finding a balance in life is the ultimate challenge for most, the necessity of it is essential. She takes break days consisting of complete laziness to ensure she maintains this balance. 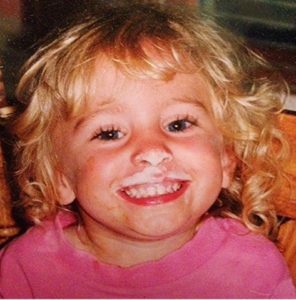 Believe it or not, Michaela Kiersch didn’t grow up as organized and meticulous as she is now. It was her need to balance school, climbing, and life that forced her to toss aside her messy habits and focus on efficiency. While her family’s belief in the importance of education inspired Michaela’s career path, her ability to witness and monitor her own self-progression in climbing is what inspires her climbing- clearly, she is a goal oriented person. She likes to focus on a specific climbing goal, train for it and relish in the progression that comes from that dedication and effort. While her short-term goals might entail a particular line that has caught her eye, her long-term climbing goals include expanding her climbing repertoire to other disciplines like trad, big wall or ice. Her long-term life goals are somewhat tradition- getting a doctorate, raising a family, seeing more parts of the world, and finding ways to give back because she has been given so much in this life. 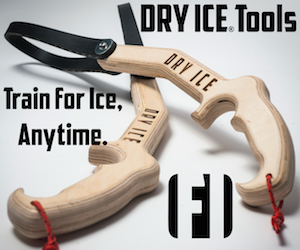 It’s refreshing to see the desire to blend the nontraditional climber lifestyle with the traditional lifestyle. If anyone can accomplish the perfect blend- it’s her. Michaela admits that, while anyone is capable of finding a similar balance, many do not want to subject themselves to the challenge. Everyone has different priorities, and hers just happens to be education. While coaching at Hidden Peak back in Chicago, she consistently encouraged her team to pursue an education, offering to help them with letters of recommendation and essay reviews to make the process less intimidating. She also recognizes the importance of being ready for college and whatever step is next before leaping into it such as a gap year between high school and college to travel and climb. Michaela Kiersch knew that entering college while pursuing a high-level of climbing would prevent her from traveling as much as her peers. Many who opt for the climber lifestyle struggle with school because of the time and need to stay in one place for extended periods of time. However, Michaela had already put her mind to the challenge and had no plan of changing the plan. While she is not one to preach openly about “the right way” to do something and believes that there are many right ways for different people, she does advise young climbers with, “Follow your dreams and listen to your parents- within reason.” If you are lucky enough to have a loving and supportive family like Michaela, she believes that “your parents know you best and should be your most trusted advisors. They will love you and guide you to the best of their abilities and hopefully with your best interests in mind.” For those less fortunate, turn to close friends or other mentors for guidance because it is worthwhile to hear a variety of opinions and options. It’s important to take the time and think carefully before making decisions. She recommends making lists- lists for figuring out the right path to take and once you make a decision, lists for how to accomplish your goals and maintain a balance. Stick to the bullet points and persevere, because as soon as you start to slip, it’s hard to stay on the correct track. 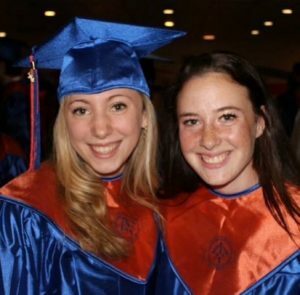 It has only been a couple of months since Michaela Kiersch completed her degree at DePaul University, which took her roughly three years rather than the typical four. 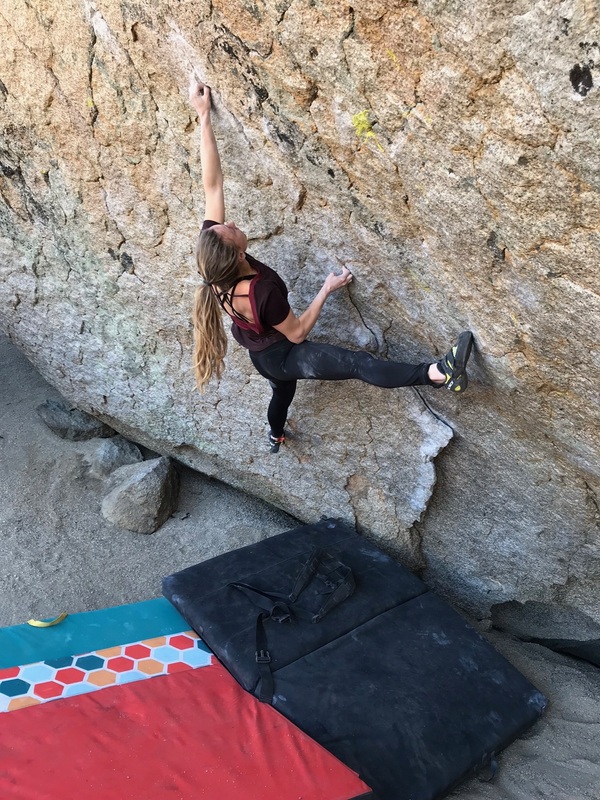 Since then, she has relocated to Salt Lake City where she will have more access to world class climbing and training facilities, be a closer driving distance to the many bouldering and sport-crags as well as where her boyfriend Kevin lives. Since graduating Kiersch has already been able to send Crown of Aragorn V13 in Hueco Tanks and get the FFA of Necessary Evil 5.14C. Completing her degree helped to perfect her work ethic, and she is no longer afraid of a busy schedule or tedious task. Undoubtedly, this has helped to relieve some of the self-inflicted pressure associated with time limits. Her favorite crag is still the Red River Gorge in Kentucky, the crag where she has grown up and sent her hardest lines, Michaela is ready to experience what the rest of the world has to offer regarding climbing. 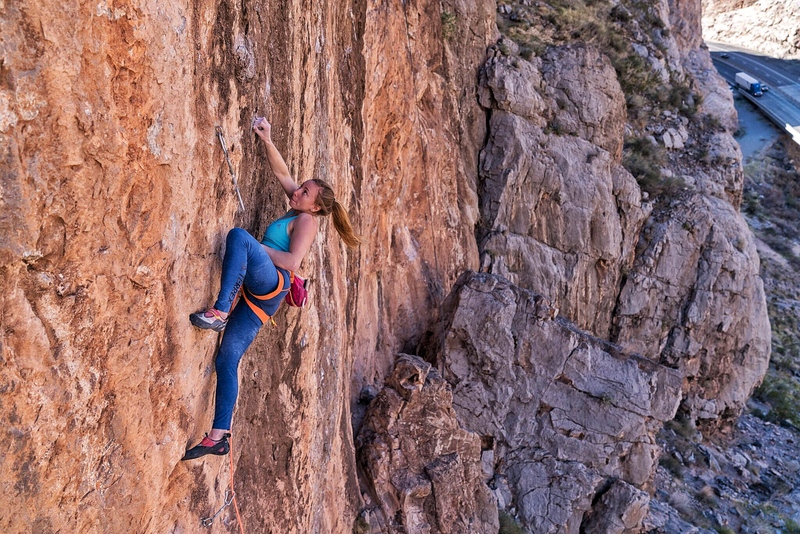 Now that she has more time to dedicate towards climbing, her typical routine consists of “Coffee, emails, climb, online shopping, lunch, climb, dinner, movie, bed.” She finally has the time to prioritize outdoor climbs, and her training has switched focus to be more in preparation for these outdoor projects. Every time she is in the gym, she does additional training for climbing. 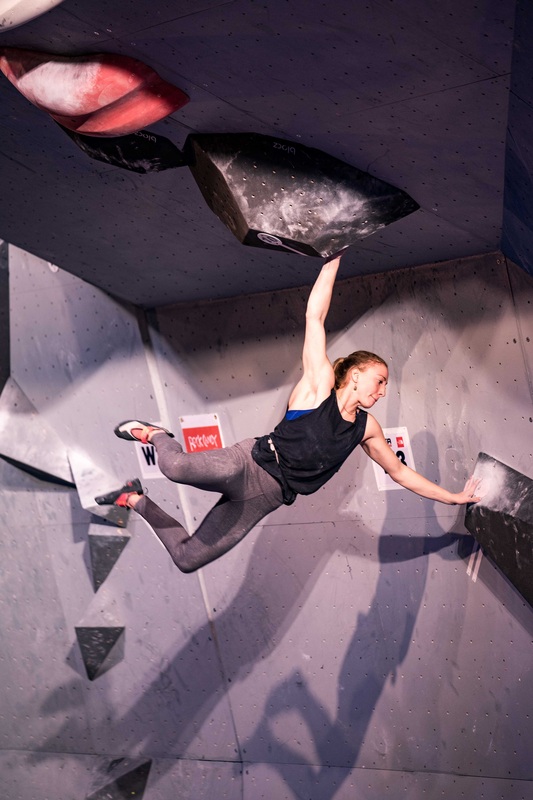 “The hardest part is to identify your weaknesses, once you have that figured out you can make a plan to target them in training.” At this point, Michaela Kiersch climbs full time, but soon she will be studying for her GRE. Most likely she will apply for her next round of schooling in 2019, but she believes in taking everything in life in stride and will see where she is in her climbing path then. Check out what Michaela Kiersch is climbing and her endeavors by following her on Facebook & Instagram.